During high and medium seasons, the apartments are rented on a weekly basis from Saturday afternnon to Saturday morning; in other periods, the minimum stay is 3 nights / 4 days. Check-in is between 14.00 and 19.00 on Saturday. Please let us know in advance (tel. +39 335 8015776) if your arrival will be delayed due to force majeure or emergencies. Departure is strictly scheduled before 10.00 am on Saturday, after checking the apartment and calculating any extra charges. Guests are required to leave the accommodation clean and tidy, making sure that any rubbish has been removed and the kitchenette has been cleaned. A deposit of 40% of the total, paid by wire transfer, is required to confirm your booking. Account holder: AGRITURISMO LEMENE DI VALERI MORENO D.I. Bank: Banca S. Biagio del Veneto Orientale B.C.C. The final balance is due at check-in. At check-out, the management reserves the right to charge compensation for any damage to the apartment. -50% if the cancellation is given within 60 days of the scheduled arrival. We offer a discount of 5% to guests who come back to Agriturismo Lemene within 2 years of their previous stay, and a discount of 5% for bookings in high season made before 31/12. – use of canoes (available upon request and only in high season). – hiring of the meeting room or other areas of the complex in low season (by prior arrangement with the management). The Municipality of Caorle charges a tourist tax that is NOT included in the price. The tax of €0.50 per night, paid at check-out, is applicable to all guests over the age of 12 for a maximum of 7 consecutive nights. The number of guests cannot exceed the number agreed at the time of booking. Guests are responsible for any damage they cause to the bicycles and canoes made available by the structure, and will be charged for repairs or replacement in the case of theft (replacements cost €100 for a bike and €400 for a canoe). 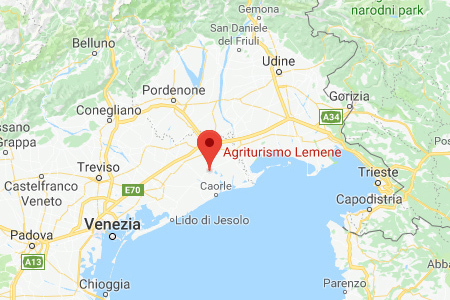 Agriturismo Lemene is insured by Cattolica Assicurazioni, policy n°05009022463158, for civil liability, damage caused to the property or harm to the guests. In exceptional circumstances, guests can bring small domestic animals, but only by prior agreement with the management and only in apartments situated on the ground floor.